Imagine you came across two different campaigns you on social media (for example, on your Facebook newsfeed), you click on the link, and reach their crowdfunding campaign. Which one would you be more likely to spend time reading or donate to? 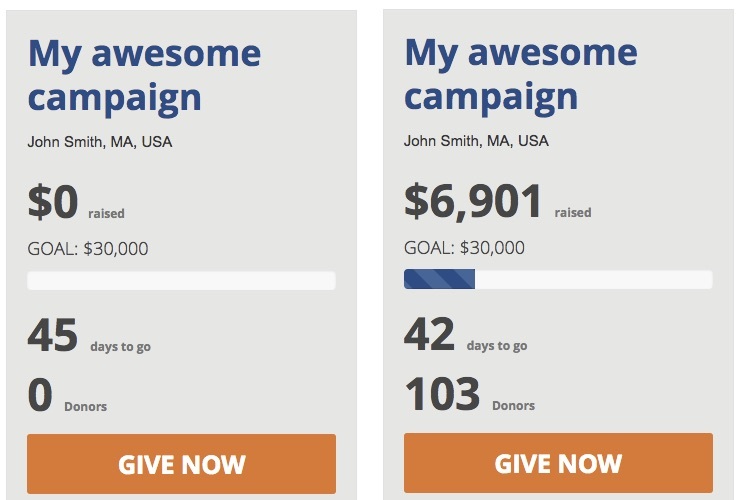 Our experience shows that people would spend more time, be more likely to donate and donate larger amounts when they look at a campaign that clearly has a great chance of reaching its goal (the one on the right). It makes sense, right? People like to be part of success stories. How should you get your first donations? In short, personal outreach. Social media might seem like the easiest way to reach people, but our experience shows that campaigns who use social media (or any mass distribution methods, like email blasts) too soon, raise less money. Your first donations should come from reaching out to people directly and personally and telling them about this wonderful thing you are doing and raising money for. The method below has been developed and tested over a few years. Campaigns that implement it in entirety reach their goal 100% of the times. In short (you should still read it all through), make a list of 100-150 people that you know personally and who would most likely donate to your cause and reach out to them directly, privately and with a personal message. Get enough donations in this way and then, and only then, use social media. At the bottom of this tutorial we provide you with various lists that you should be building in preparation for different different stages of your campaign. This method is meant for campaigns that wish to raise over $5,000. If you are looking to raise a lower amount, you should still implement the method but perhaps lower the numbers we state. While preparing your campaign page, it is time to start preparing your “launch list”. These should be people that you know personally (or the people on your team know personally). It can be friends, family, colleagues, past funders, etc. Roughly 3 to 14 days (not more than 2 weeks) before launching your campaign (yes, the campaign is not live yet), you should contact these people and tell them that you are planning a campaign and ask them if they would be willing to be part of it when you launch. You can and should explain that you must show some support early on for others to follow (remember the tip jar story?). You should also tell them that you will notify them when you launch. If they show positive interest, you mark them as “yes” on your list. If you are not certain from their reaction, mark them as “maybe”. No need to discuss the amount people would contribute. Your goal is to gather as many “yes” as possible. You can contact the people on your list in any means you choose. More personal ways such as phone calls are preferred, however, other ways such as e-mail and text messages are also ok. It is important that you do not use any mass distribution methods (like public posts or group emails). You should launch your campaign if and only if you have 50-100 people that said “yes”. If you want to raise over $10,000, it should be 100. Once you have enough people that told you personally that they would support (at least 50, we recommend 100), then you should launch your campaign (of course, your page should make sure your campaign is ready). It is time to notify all those people that said “yes” in the silent stage that the campaign is live and ready for their contribution. Provide them with the direct link to your campaign page (make sure you have the correct link and that you do not change it). Do not post about the campaign publicly yet. Once you see contributions coming in, you can start contacting other people directly and personally. They could be people that you added to the list or even people that were “maybe” on the list you used before. You should keep doing this step until you have reached 50 funders (if you want to raise more than $10,000, it should be 100 funders), or you reached 30% of your goal with at least 30 funders. You should have many funders at this stage and momentum is high. At this stage, you contact all the funders (make sure you know how to download your funders list), thank them and ask everyone to start sharing. Ideally, you set a day in advance (best days are Tuesday / Wednesday) that everyone will share at the same time. This is the day that you start sharing it on social networks (in any way possible). Many more people would be exposed to your campaign if you get many people to talk about it at roughly the same time (than if they all do it sporadically over time). Facebook groups are a great way to get people to hear about your campaign page. Make a list of groups that discuss topics relevant to your cause and join them. Be sure to follow the rules of each group. Make sure you understand the difference between Facebook pages and Facebook groups (you want groups, not pages). “Influencers” are people that have many followers and can reach many people easily. They can be celebrities (in their fields or in general) or just experts that over time gathered followers. When and if they share your campaign, it would reach many people. You should identify them in advance (make a list while building your campaign) and contact them only after you implemented all the previous steps. These people would typically not want to “pick you up” but to tell people that follow them about something trendy. Similarly to the influencers, you should prepare a list of media outlets that can include magazines, news outlets and even Facebook pages that have many followers. You should contact them after you have reached at least 50% of your goal and it is very likely and clear you are going to reach your goal. Remember that they will not be looking to turn your campaign “viral” but rather report about something that already became “viral”. Influencers – People that you know (and maybe some that you do not) who have influence in the “space” your campaign is related to. This can include Facebook pages. Media outlets – Media outlets that are both influential and related to your campaign cause.